Explanation: Comet 252P/Linear's lovely greenish coma is easy to spot in this expansive southern skyscape. 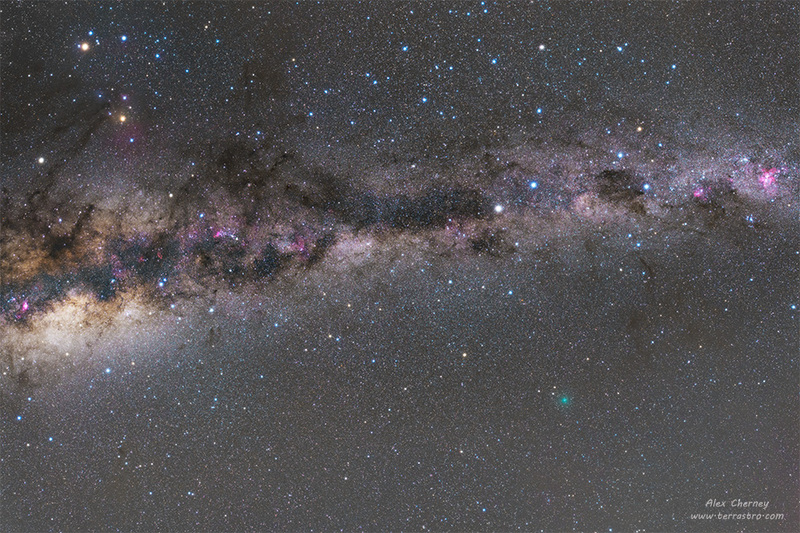 Visible to the naked eye from the dark site near Flinders, Victoria, Australia, the comet appears tailless. Still, its surprisingly bright coma spans about 1 degree, posed here below the nebulae, stars, and dark rifts of the Milky Way. The five panels used in the wide-field mosaic were captured after moonset and before morning twilight on March 21. That was less than 24 hours from the comet's closest approach, a mere 5.3 million kilometers from our fair planet. Sweeping quickly across the sky because it is so close to Earth, the comet should be spotted in the coming days by northern hemisphere comet watchers. In predawn but moonlit skies it will move through Sagittarius and Scorpius seen toward the southern horizon. That's near the triangle formed by bright, yellowish, Mars, Saturn, and Antares at the upper left of this frame.